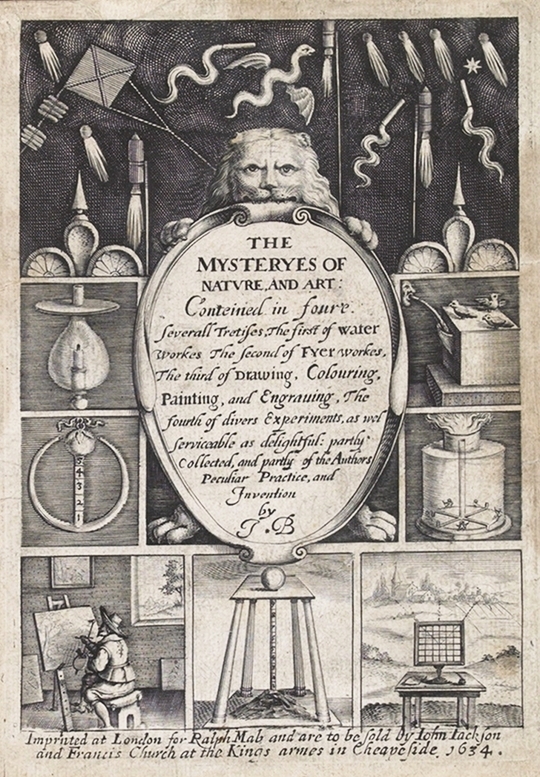 Julie Gardham, Senior Assistant Librarian at University of Glasgow’s Special Collections Department, takes a look at the book that was said to have spurred a young Isaac Newton onto the scientific path, The Mysteries of Nature and Art by John Bate. Courteous reader, this ensuing treatise hath lien by mee a long time, penned, but in a confused and undigested manner, as I gathered it, practised, or found it out by industry and experience. So begins the preface to The Mysteries of Nature and Art by John Bate, one of the most charming of seventeenth-century illustrated technical compendiums. Describing mechanical contrivances that are a mix of the useful and bizarre, this work tackles the subjects of water works, fire works, drawing and painting, and miscellaneous experiments – the last of which Bate terms ‘extravagants’ because they are ‘confusedly intermixed’. 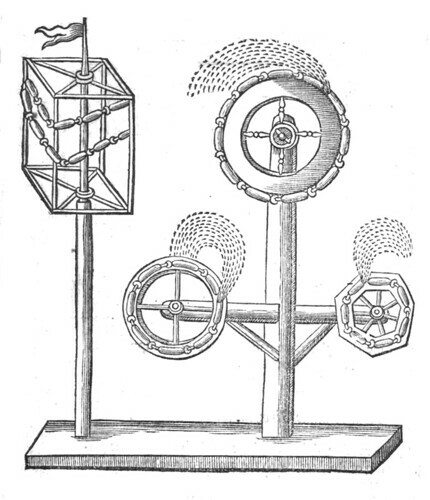 Technical manuals were produced prolifically in the seventeenth century, reflecting progress in technological growth. This was a time of fundamental transition, with a spirit of initiative and invention that resulted in significant advances in science. Innovations and developments in areas such as mechanics, astronomy and chemistry were to pave the way for the industrial revolution. Dissemination of new ideas via printed treatises was crucial to the efforts of inventors and technicians. Bate’s work is resolutely practical in nature. Originally printed in 1634, according to the title-page its ‘treatises’ were ‘partly collected, and partly of the authors peculiar practice and invention’; as stated in the preface, Bate wrote it based on ‘industry and experience’. A small, economical and easily portable book, it was popular enough to warrant the publication of an expanded second edition only a year after the first. A further augmented edition was produced in 1654. While containing more illustrations, this last edition is poorly printed and is not nearly so attractive as its predecessors. 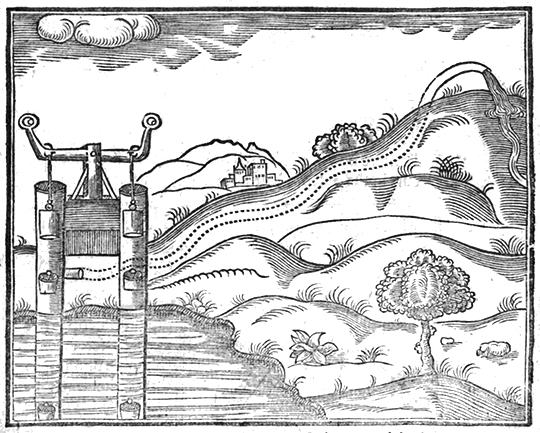 The first section on water-works describes various ingenious machines that convey and force water. There is, for example, an engine ‘to force water up to a high place’; this pump, we are informed, is ‘very usefull for to quench fire amongst buildings’. Other devices include weather glasses, water clocks, fountains, siphons, pumps, waterwheels, and watermills. Of the various water clocks described, my favourite has to be the one which utilizes a rather jolly grinning skeleton who marks the hours from a moving platform, reminding us all of our eventual doom. Bate was evidently always on the look out for new ideas. 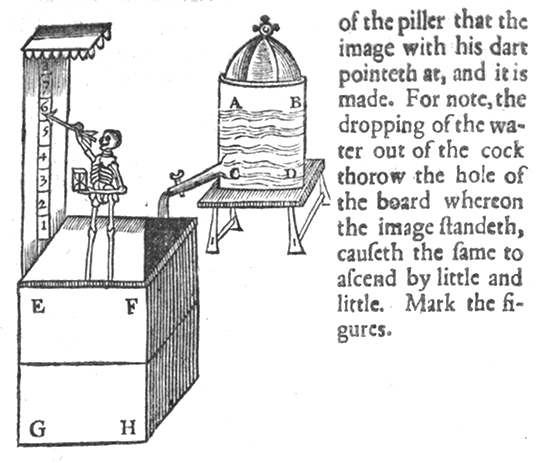 The expanded second edition of his book contains many additions to the water-works section, including the description of the model of a water mill that he copied after seeing it at London bridge in 1633. He explains that it utilizes the ebb and flow of the River Thames, thereby conveying the water ‘above two miles in compasse, for the use and service of that city’ and praises it as ‘seeming very good’. These waterworks were well known; they were only demolished when London bridge was rebuilt in 1822. But while many of Bate’s examples are undoubtedly practical, there are also several rather more outlandish machines designed solely for ‘recreation and delight’. Thus, we find ‘experiments’ for ‘producing sounds by ayre and water’. 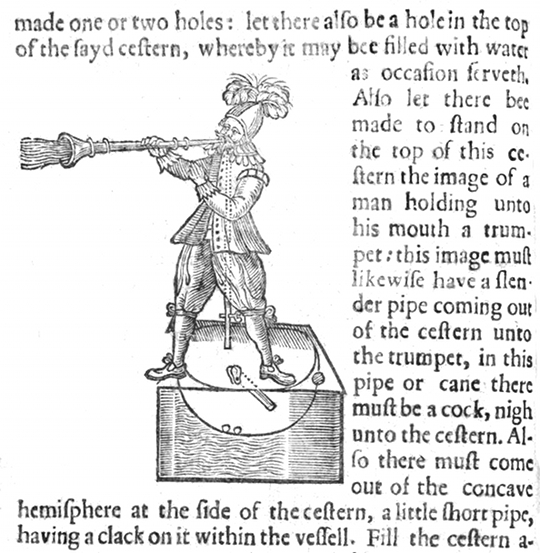 These rather delightful devices include one ‘whereby severall voyces of birds cherping may be heard’ and another ‘whereby the figure of a man standing on a basis shall be made to sound a trumpet’. 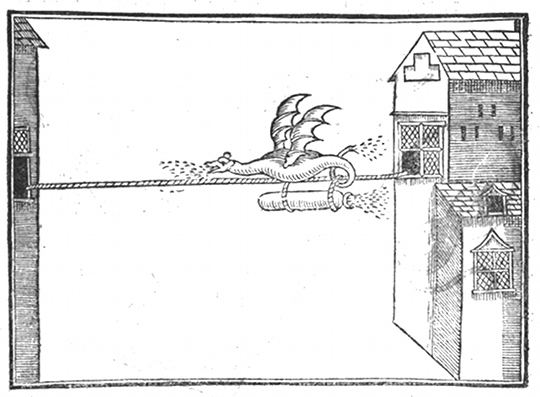 A further elaborate machine is a depiction of Hercules ‘shooting at a dragon, who as soon as he hath shot, hisseth at him’. Many of these were designed expressly to decorate and enhance gardens, perhaps demonstrating that an obsession for complicated water features is not as modern a phenomenon as we think. 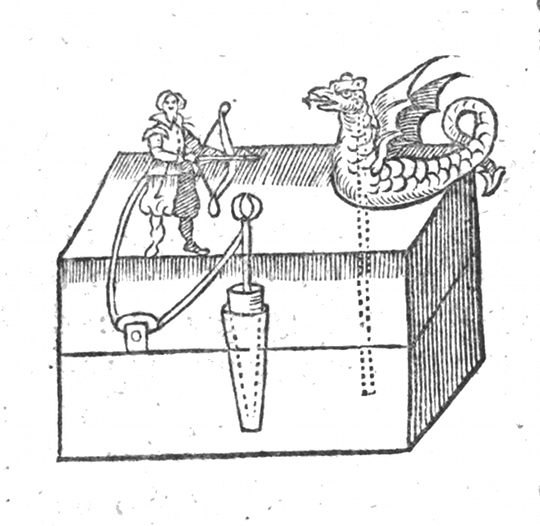 The second part treats of fireworks ‘for tryumph and recreation’. Its title-page is illustrated with a woodcut depicting a ‘green man’ wielding a fire club. With obscure and mythical origins, green men dressed in foliage and garlands traditionally led processions of fireworkers from medieval times. The customary greeting amongst the firework fraternity is still ‘stay green’. Originally developed in China, fireworks have been used to mark celebrations and spectacles for hundreds of years. Bate begins with an introduction to the basic principles of the nature of elements and instructions in choosing ingredients, such as saltpetre, brimstone, coals and gunpowder. Detailed directions and guidance on the composition of various kinds of fireworks follow. It is surprising to see how many devices still in use today were familiar to Bate, including crackers, rockets and ‘fire wheels’. Some, however, can only be described as ambitious; even Bate admits that his flying dragon is ‘somewhat troublesome to compose’. Bate next discusses art. He covers drawing in general, as well as techniques for ‘washing’ maps and other pictures with water colour, limning, painting in oil, painting on glass, and engraving. There is much interesting advice on choosing the correct equipment, with recipes for mixing and creating colours. 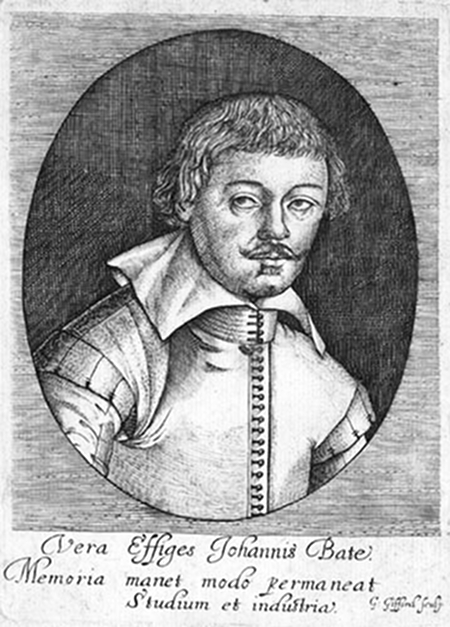 Several pages are devoted to wood engraving; in the second edition, Bate comments that engraving is ‘farre more tedious and difficult than the working in brasse’. The artist who actually produced the woodcuts for the Mysteries – which add so much to the book’s charm, no matter how troublesome the job – is not named. The final part of Bate’s work is a miscellany of recipes and ‘secrets’, both technical and medical. These ‘extravagants’ incorporate ‘severall Experiments, as well serviceable as delightfull’. A mixture of odd information is found here. 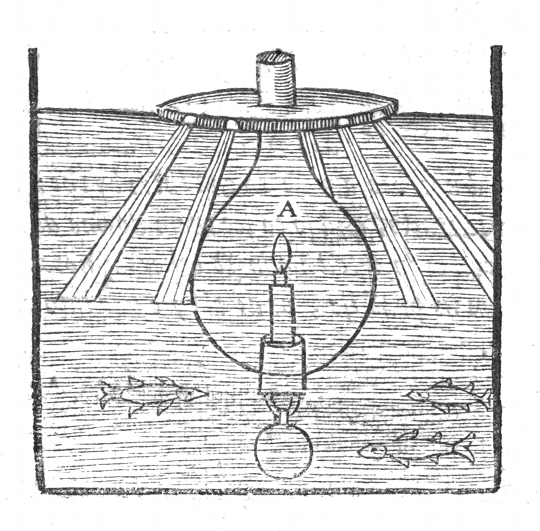 There are several methods of catching fish, including a technique for burning a light under water so that apparently ‘all the fishes neere unto it will resort about it, as amazed at so glorious a sight, and so you may take them with a cast net or other’. Bizarre ways of catching birds are also given, amongst them one ‘to make birds drunk, so that you may take them with your hands’. Additionally, there is instruction in how to melt metal, how to make ice that will melt in fire but not dissolve in water, how to make cement and marble, and how to make invisible ink. Finally, there are some recipes for treating a wide range of ailments, from balms for sciatica and ointments for burns and toothaches, to medicine for ‘the biting of a mad dogge’. It is reassuring to note that Bate endorses his treatment ‘for to heale a red face that hath many pimples’ as being ‘proved’. Frustratingly, nothing is known about the author of this highly entertaining compendium. His portrait (which appears only in the second edition) is supplied, but he offers no biographical information about himself. The three editions I have had the pleasure of examining all come from the collection of John Ferguson, who was Professor of Chemistry at the University of Glasgow from 1874 to 1915. He tartly remarks that this portrait ‘represents Bate, who, doubtless, was a decent law-abiding citizen, as a person for whom no villainy would be too great to perpetrate’. Predominantly a collector of alchemical works, Ferguson was also very interested in books relating to the history of inventions and ‘books of secrets’. Such texts are not studied as part of the modern science curriculum, but Professor Ferguson staunchly defended his belief in their importance, explaining that ‘the history of practical invention and of technical progress is one which might well engage the attention of students of anthropology and antiquities, as it throws light on many points connected with the growth of social life and civilization’. He also succinctly defines the arcane terminology for such works as books of ‘secrets’, saying: ‘the arts must be acquired by practice, and they are extended and improved by practice. Every one who exercises them comes to have special power and certain ways of doing things, which may enable him to surpass others who are similarly engaged. These are his “secrets”, which very often he cannot, or will not, reveal to others’. While some of the knowledge imparted in Bate’s Mysteries may seem to us crude, if not downright eccentric, it is important to remember that manuals such as these did play an important role in the dissemination of scientific information. Ferguson actually recommends this text as a ‘book of genuine receipts’, its contents being ‘quite sensible and practical’. 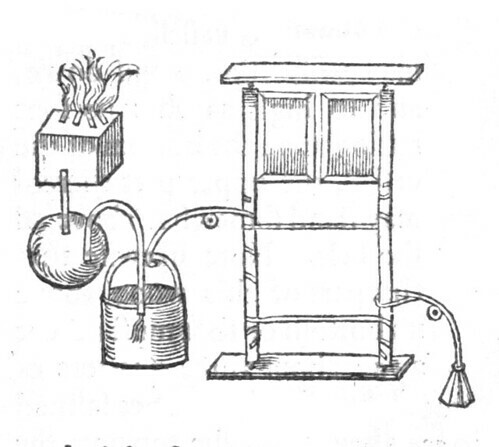 He praises Bate for describing apparatus that he had actually tried and found would work – unlike some of his contemporaries ‘who often gathered nothing else but mere nonsense’. The mysteries of nature and art, conteined in 4 severall tretises. 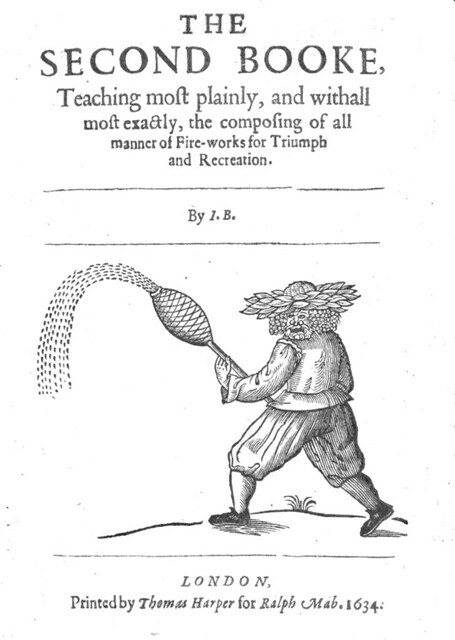 Partly collected, and partly of the authors peculiar practice, and invention (1634) by J.B.